We - a family of 5 adults and 1 teenager - stayed at the villa for 7 days. To start with the positives, the staff running the villa are magnificent. Larihu - 23 years old - manages the day to day life of the villa. He has trained as a chef and cooks the finest food. He arranges the evening meal in consultation with the guests and then goes off to the local market to buy the food. The local fish, in particular, is fresh and very tasty. He will cook any type of food, but his Sri Lankan dishes, in particular, are excellent. In addition, he will bake for afternoon tea - superb lemon, coconut, or banana cakes. He is an excellent host willing and able to provide advice and information on everything. His team of helpers - his mother who is responsible for indoor cleaning, etc and Kusum who is responsible for garden maintenance and security - are very friendly and efficient. They will arrange Tuk Tuks or car hire for wherever you wish to go, and these local drivers are also very friendly. The villa is situated by the lake. It is quiet and peaceful and the view of the lake is stunning. The garden is well maintained and there is a small swimming pool. The villa is about 15 minutes by Tuk Tuk from the beach. Overall, the villa is well equipped. But for the price one is paying, the owner needs to invest in some improvements. For example, some of the fans in the bedrooms need repair and maintenance. It can be hot and stuffy at night and the ventilation is not as good as it should be. The bedding - mattresses and sheets - need replacing . And the hot water system for the showers should be upgraded - a hot water shower only lasts about 5 minutes. So, in conclusion, a very positive experience, but the owner needs to put some money into renovation if he is to warrant charging this price. This is a really beautiful villa with great service, views, privacy and incredible food. 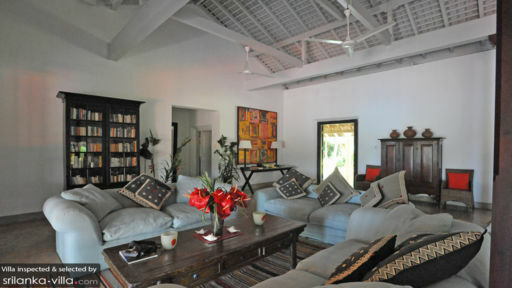 It is built in a traditional style with terracotta roof tiles and a wide verandah. The rooms are well furnished with four posters, mosquito nets etc. 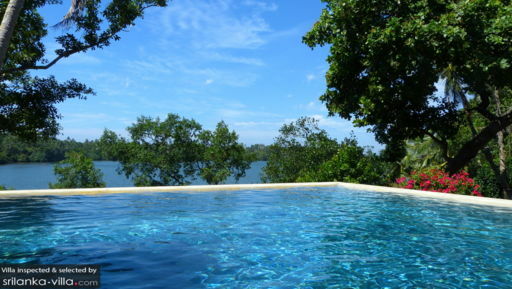 The pool is deep and well positioned with wonderful views over Lake Koggala. There are two breeds of monkeys in the garden who provide great entertainment while eating breakfast and having sunset drinks. We enjoyed gin and tonics on the terrace while watching the sun setting over the lake. In fact, all of our meals were taken on the terrace while watching the ever-changing vista. Lahiru is an inspired cook and provided us with some of the most memorable food of our trip. One of the highlights being loofah curry. He goes to the market daily and chooses the best produce of the day to create amazing three course meals. He catered very well to our vegetarian children too. Wine is available to purchase through the house manager. It is a quick trip to Wijaya Beach which has a great cafe on the beach (the chilli coriander prawns with avocado and mango salad, washed down with an Italian rose is a must!) and giant turtles to swim with out the front. You can hire snorkels from a couple of spots on the beach and there are several tropical fish to see as well as the turtles. Galle Fort is about a 30 minute drive away. 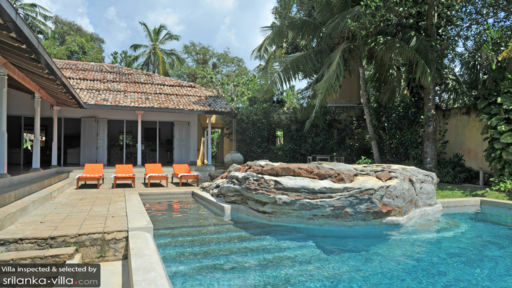 Our stay at Kimbulagala Watte Villa was the highlight of our three weeks in SL. I first visited Kimbulagala Watta a couple of years ago, to celebrate a milestone birthday with my husband and two of our grown-up children and their partners. We enjoyed ourselves so much on that occasion, that we didn’t hesitate to book the house again for our return visit in October 2015. In charge is Lahiru, a small man with an enormous smile, who looks after the villa (with part-time help from his mother Nanda) as well as cooking to perfection. Also on the staff is the characterful Kusumsiri, who can do everything from guarding the gates to prepping the vegetables to waiting at table; all tasks performed with huge solemnity. The house is lovely, with three double bedrooms all en-suite, and a large indoor seating area. From there, full length shutters open onto the large verandah, which wraps itself round the whole house. I could happily have spent most of my holiday out there on the verandah, whether at the dining table eating Lahiru’s delicious food, or relaxing in the hammock or the “planters’ chairs” admiring the beautiful view and enjoying the cooling breezes blowing in off the lake. Read a book, make use of the excellent wifi, or just watch the wildlife - exotic birds, land monitors, monkeys playing in the trees; or dive off the rock into the gorgeous pool. So really the only business of the day is to discuss with Lahiru what he should buy fresh from the market and cook for you. Prawns, jumbo prawns, grilled fish, baked crab (sensational) and his rice and curry is world class. This is a place you really have to experience - and I shall certainly be back !